I feel so blessed to begin teaching Preschool at St. Joes this year. Since my children began their academic journeys here in 2013, I have absolutely loved and adored the SJS community, and now to be an even greater part of it, fills my heart with great joy. 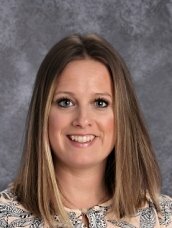 Last year, I joined the staff as the 1st grade aide, but this will be my first year of teaching in a Catholic school, and my 5th year teaching overall. they can feel the presence of the Lord all around them! When I am not in the classroom or helping out at St. Joes, you can find me at home with my husband, two kiddos, and our fur-baby. I enjoy reading, facilitating my online Bible study group, and simply spending time with my family. I am a lover of all things books and thrilled that my daughter shares the same passion. I dream of one day writing my own children’s book. I am looking forward to all the adventures that await us this school year and pray that the Good Lord bless us all.